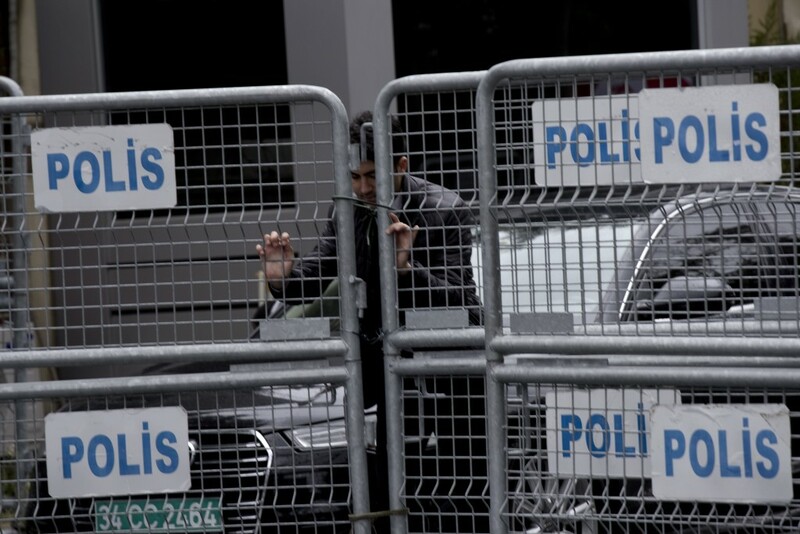 ISTANBUL (AP) — Turkish officials have an audio recording of the alleged killing of journalist Jamal Khashoggi from the Apple Watch he wore when he walked into the Saudi Consulate in Istanbul over a week ago, a pro-government Turkish newspaper reported Saturday. The new claim published by the Sabah newspaper, through which Turkish security officials have leaked much information about the case, puts more pressure on Saudi Arabia to explain what happened to Khashoggi. 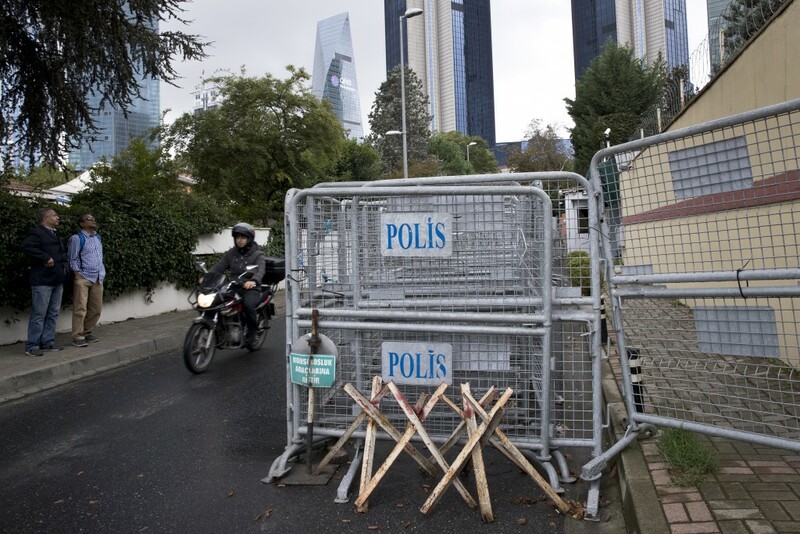 Also Saturday, Ankara's top diplomat reiterated a call to Saudi Arabia to open up its consulate, from where Khashoggi disappeared, for Turkish authorities to search. The writer, who has written critically about Saudi Crown Prince Mohammed bin Salman, vanished after he walked into the consulate on Oct. 2. The kingdom has maintained the allegations against it are "baseless," though an official early on Saturday — on Khashoggi's 60th birthday — acknowledged for the first time that some believe the writer was killed by the kingdom. The disappearance has put pressure on President Donald Trump, who has enjoyed close relations with the Saudis since entering office. On Saturday, Trump expressed concern about Khashoggi's fate and about the lack of answers, so many days after the journalist disappeared. "Our first hope was that he was not killed but maybe that's not looking too good from what we hear but there's a lot to learn, there really is," Trump said at the White House while welcoming back American pastor Andrew Brunson, freed after nearly two years of detention in Turkey. He later said he anticipated speaking to the Saudi ruler Saturday or Sunday. Turkish authorities recovered the audio from Khashoggi's iPhone and his iCloud account, the newspaper said. The journalist had given his phones to his fiancée before entering the consulate. The newspaper also alleged Saudi officials tried to delete the recordings first by incorrectly guessing Khashoggi's PIN on the watch, then later using the journalist's finger. However, Apple Watches do not have a fingerprint ID unlock function like iPhones. The newspaper did not address that in its report. An Apple Watch can record audio and can sync that later with an iPhone over a Bluetooth connection if it is close by. The newspaper's account did not elaborate on how the Apple Watch synced that information to both the phone and Khashoggi's iCloud account. Turkish officials have not answered queries from The Associated Press about Khashoggi's Apple Watch. Turkish officials say they believe a 15-member Saudi "assassination squad" killed Khashoggi at the consulate. They've also alleged that they have video of the slaying, but not explained how they have it. But Carrie Cordero, a senior fellow at the Washington-based Center for a New American Security who formerly worked on intelligence matters for the U.S. government, wrote recently that "the Turkish government may need to reveal sources it does not want to reveal if the Saudi Arabian government continues to deny involvement despite evidence Turkey has in its possession." Saudi Arabia has said it had nothing to do with Khashoggi's disappearance, without explaining or offering evidence of how the writer left the consulate and disappeared into Istanbul with his fiancée waiting outside. A Saudi-owned satellite news channel has begun referring to the 15-man team as "tourists," without providing evidence to support the claim. It echoes how Russia has described the men who allegedly carried out the Novichok nerve agent poisonings in Salisbury, England, in March. Early on Saturday, the state-run Saudi Press Agency published a statement from Saudi Interior Minister Prince Abdulaziz bin Saud again denying the kingdom's involvement. This time, however, it acknowledged for the first time that Saudi Arabia was accused of killing Khashoggi. "What has been circulating in terms of supposed orders to kill Jamal (Khashoggi) are outright lies and baseless allegations against the Kingdom's government, which is committed to its principles, rules and traditions and is in compliance with international laws and conventions," Prince Abdulaziz said. Omer Celik, a spokesman for Erdogan's ruling Justice and Development Party, said that Khashoggi's disappearance will be "investigated strongly." 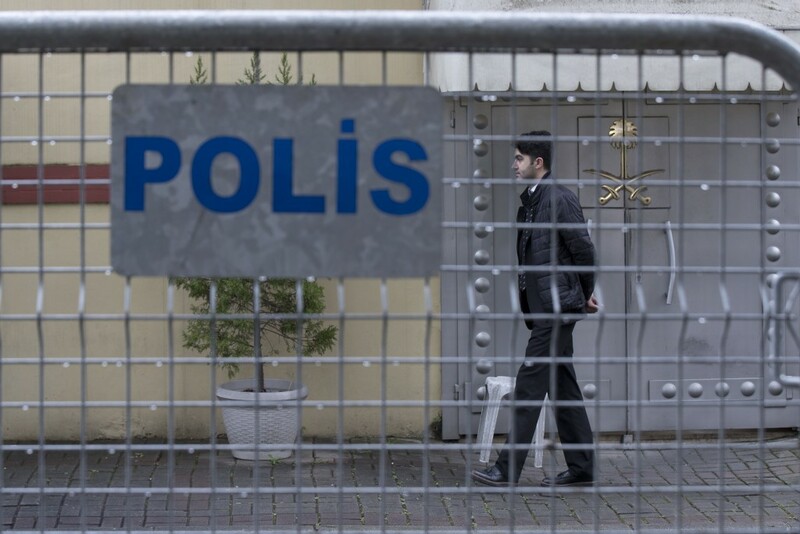 A delegation from Saudi Arabia arrived in Turkey on Friday as part of a joint investigation into the writer's disappearance. "Such an act is an attack on all the values of the democratic world. It's an act that will never be forgiven or covered up," he said. "This is not an act that Turkey would ever consider legitimate. If there are people who committed this, it will have heavy consequences." However, Turkey's Foreign Minister Mevlut Cavusoglu said Saudi Arabia had not yet cooperated with Turkey on the search for Khashoggi. He said Turkish "prosecutors and technical friends must enter" the consulate "and Saudi Arabia must cooperate with us on this." Earlier in the week, Saudi Arabia had said it would open the consulate for a search but that is yet to happen. Cavusoglu said Turkey would share information with Saudi Arabia in the "joint working group" but stressed the Turkish investigation would continue separately. Trump also said Saturday that "we would be punishing ourselves" by canceling arms sales to Saudi Arabia. The sale is a "tremendous order for our companies," he said, and if the kingdom doesn't buy its weaponry from the United States, they will buy it from Russia or China. Trump said that he would meet with Khashoggi's family. Separately, Secretary of State Mike Pompeo spoke to Khashoggi's fiancée, Hatice Cengiz, who had accompanied him to the Saudi consulate. The State Department released no details of the conversation. In an interview Friday with the AP, Cengiz said Khashoggi was not nervous when he entered the consulate to obtain paperwork required for their marriage. "He said, 'See you later my darling,' and went in," she told the AP. In written responses to questions by the AP, Cengiz said Turkish authorities had not told her about any recordings and Khashoggi was officially "still missing." She said investigators were examining his cellphones, which he had left with her. On Saturday, Cengiz tweeted about a surprise party she had planned for Khashoggi's birthday, "invited all his close friends to a restaurant on the #TheBosporus to celebrate his birthday but," she said, adding the hashtags "WhereIsJamal" and "mydreamwaskilled." 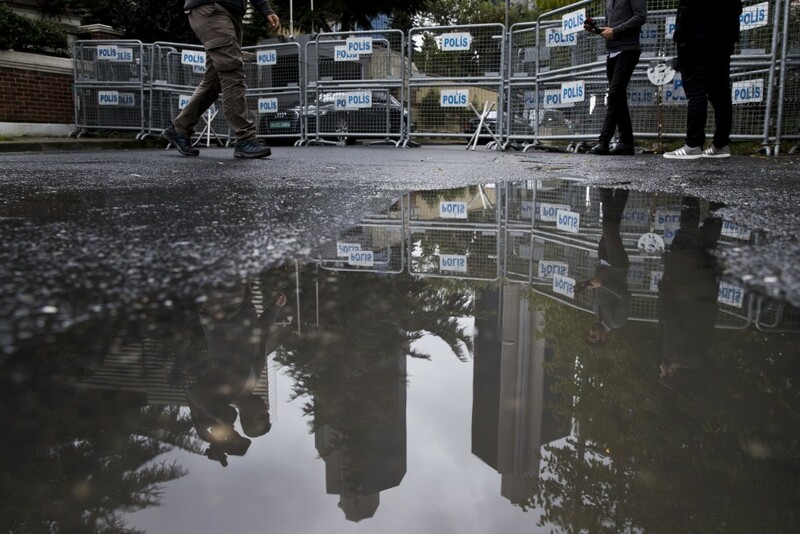 Global business leaders also are reassessing their ties with Saudi Arabia, stoking pressure on the Gulf kingdom to explain what happened to Khashoggi. Khashoggi, who was considered close to the Saudi royal family, had become a critic of the current government and Prince Mohammed, the 33-year-old heir apparent who has shown little tolerance for criticism. 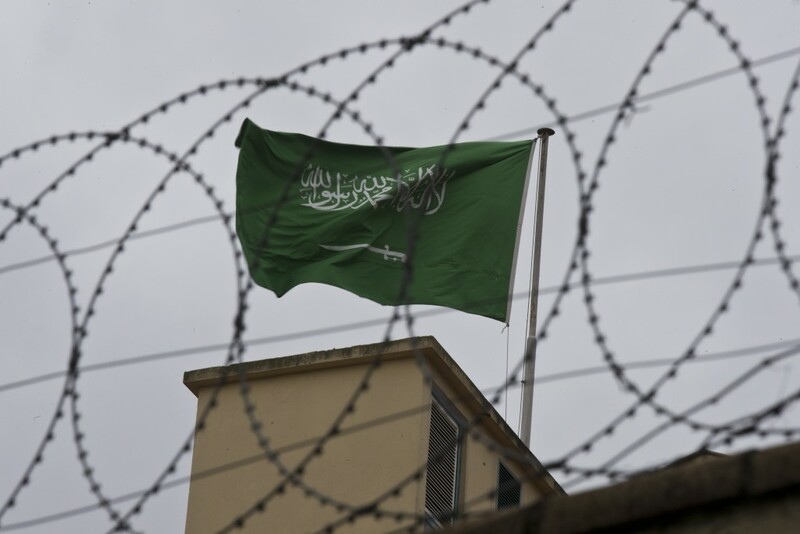 As a contributor to the Post, Khashoggi has written extensively about Saudi Arabia, including criticism of its war in Yemen, its recent diplomatic spat with Canada and its arrest of women's rights activists after the lifting of a ban on women driving. Gambrell reported from Dubai, United Arab Emirates. Associated Press writers Zeke Miller and Darlene Superville in Washington and Suzan Fraser in Ankara contributed to this report.